WASHINGTON — The Republican’s longtime minority Senate leader, Mitch McConnell, now has a Democratic opponent in his 2014 re-election shot. Reuters reports that the Kentucky senator is facing a challenge from the state’s Democrat Secretary of State Alison Lundergan Grimes. The Democrat-leaning polling outfit Public Policy Polling found that McConnell and Grimes were tied at 45% each, and McConnell had a 44% approval rating among Kentuckians with a 47% disapproval rating. McConnell has served as the state’s senator for the past 28 years, which Grimes said has been “28 years of obstruction”. But, some still say McConnell is the favorite and have criticized how Grimes’ purported campaign website is lacking. RedState, a conservative website, called it “blithering incompetent” to be this unprepared to run against McConnell. 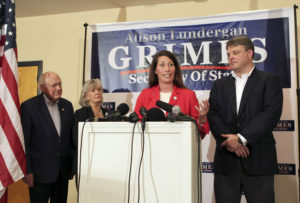 UPDATE: grimesforsenate.com is run by the National Republican Senatorial Committee (NRSC) and Grimes’ official website is alisonforky.com.